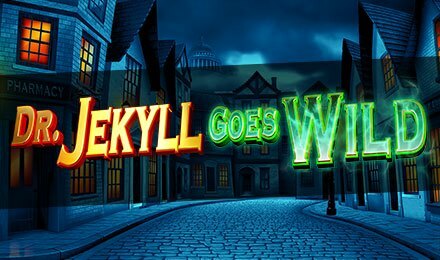 Playable at Wicked Jackpots, Dr. Jekyll Goes Wild slots is themed on the famous novel which tells the tale of Dr. Jekyll. When you start this game, it opens up on a lonely street backdrop which is home to the 5 reels and 10 paylines. Anytime you want, you can enjoy this thrilling slot game on either a tablet, a mobile phone or a laptop. Once started, the various symbols you will see on the reels are 10, J, Q, K, A, Mr. Hyde, Dr, Jekyll, Scrolls, Sand Time, Street Lights, Test Tubes and Big Ben. You can win on this online slot game when combinations of 3 or more symbols appear in any position on the reels, on a winning payline. You can win different winnings as per the paytable. You will find the auto-play field on this game; by using this option, you can have few games played automatedly. Bet Levels: The various bet levels you can choose from on this game vary from 1 to 10. You can make your selection by clicking on the minus or plus signs. Amount of Paylines Selection: Ways to win remain fixed on this slot game, and cannot be adjusted. Coin Values: You can select your stake on the Coin Tab. The values you will find range from £0.10 to £500.00. There are many features on this slot game, and they can be triggered at random. The special symbols you will discover on the reels are scatters and wilds. You will find the Big Bet Mode, and you can grab bigger wins by opting for these. The stakes you can choose under this mode range from £20 to £50. You are offered 5 linked spins with special features for any Big Bet Mode. When 3, 4 or 5 scattered symbols are seen in any position on the reels, the Free Spins Feature is launched. This round awards up to 20 free spins, and you can win additional free spins when wilds are seen on the reels.